Fun bright Cocktail button badge. 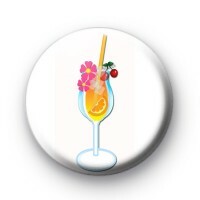 This beverage themed badge has a pretty floral, tropical cocktail in the middle and is a lovely badge for a girls night out or a hen party! We have a number of alcohol-themed badges in the shop so be sure to take a look at those too!